A semi truck crashed into a barrier on Interstate 5 in Tacoma early Wednesday morning, bringing traffic to a halt. The incident occurred just after 3:30 a.m. on southbound I-5 near State Route 16 at S.M. Street. The truck crashed into the center barrier, blocking all lanes of traffic in both directions. The closure lasted for several hours as crews worked to clean up the 120 gallons of fuel on the roadway. Minor injuries were reported in the crash. Washington State Patrols says another collision occurred in the northbound lanes shortly afterwards due to the barrier damage from the first crash. Minor injuries were suffered in the second collision. WSP says the causing semi truck driver was cited for negligent driving, which carries a $550 fine. The stretch of I-5 where Wednesday morning’s collision occurred has become extremely problematic. 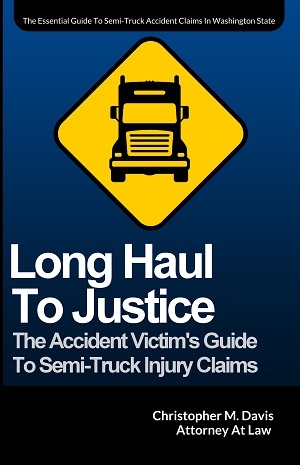 In fact, it’s the sixth semi truck crash in the general area since late September. All of the collisions have happened late at night or early in the morning, the most recent being a January 17 crash. 2 Semi Rollover Collision on I-5 Ramp in Tacoma. Police say the causing semi truck was traveling on the ramp from northbound I-5 to I-705 when it hopped the curb dividing the lanes and crossed onto the ramp from State Route 7 to I-705. It then struck the other semi truck that was traveling on the SR 7 ramp. 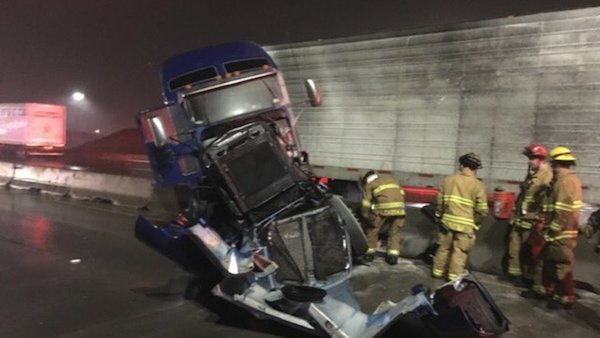 Jackknifed Semi Causes Pileup on I-5 in Tacoma; 6 Injured. A semi truck driver heading south on I-5 jackknifed, hit the center barrier and caused another semi driver to hit the barrier. The semi in the northbound lanes hit at least five other vehicles, one of which rolled. Six people were injured, one seriously and in intensive care, police said. Pair of Vehicle vs. Barrier Collisions on I-5 in Tacoma. A box truck hit the center concrete barrier, pushing the barrier into the northbound lanes and causing other northbound vehicles to hit the barrier. A total of four semi trucks and three other vehicles were involved. In a separate incident 45 minutes later, a northbound semi truck hit the barrier at South 38th Street. The driver of the semi tractor, which was not carrying a trailer, failed to adjust to the traffic from the first crash and ended up losing control.